CHICAGO — Don't watch "Open Tables" on an empty stomach. You'll just get hungrier. The forthcoming independent film from Chicago filmmaker Jack C. Newell takes place in some of the city's hottest restaurants. In every scene, someone is eating or drinking. If you must classify it, "Open Tables," which is wrapping up filming in Chicago this week, is a romantic comedy, said Newell, who wrote the film and is also directing it and acting in it. But it also is a love letter to the things Chicago does best — food and improv. "I just love food," said Newell, 31, a Columbia College of Chicago graduate. "I like the culture around it. I like the experience of people sitting around the table eating, sharing stories. One of the most primal things we have is this desire to want to get together and share stories and food." The restaurants that serve as the backdrop in "Open Tables" — Longman & Eagle, Trenchermen, the Publican, Acadia and Graham Elliot among them — are characters in themselves. At least one food truck, 5411 Empanadas, will have a cameo. "For the audience, myself included, a lot of these restaurants are part of our lives," said Newell, who lives in Old Town. "We've had first dates there, breakups there. We've had great meals there." Big names in the local improv and theater scene make up the cast, including David Pasquesi, TJ Jagodowski, Joel Murray, Beth Lacke and Caroline Neff. More than half of the film is improvised, Newell said. This isn't Newell's first made-in-Chicago, food-focused film. Last year he directed "Close Quarters," set entirely in a coffee shop. The set was built where a coffee shop once had been at Sheffield Avenue and Barry Street in Lakeview. Newell describes "Open Tables" in halves. The first revolves around a dinner party, where the characters converge and three intertwined stories take shape. In the second half, those stories, told through flashbacks, are resolved. The restaurant scenes were shot in the mornings. That presented some challenges, Newell said. 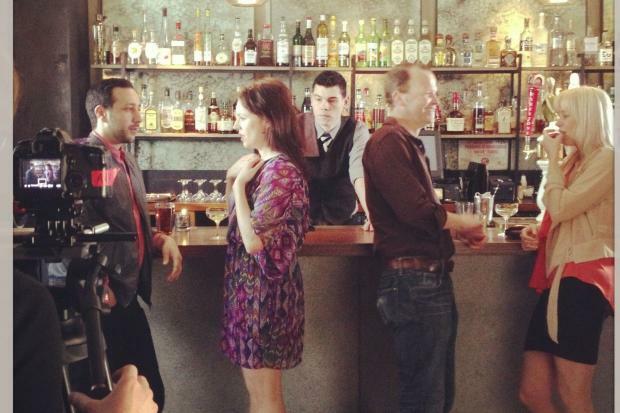 Filming at the Logan Square cocktail bar Scofflaw, for example, was on a Tuesday morning — delivery day. "So we'd do a take and some guy would knock on the door and he'd have, like, towels. And then another guy would knock and come in with a keg of beer," Newell said. "There was this funny tango between deliveries and this film we were trying to make." "We ended up drinking too much at Scofflaw," he said. In June, Newell and crew are off to Paris for a few more days of shooting. ("How do you make a movie about food and not go to Paris?" Newell said). He aims to finish by fall, in time to shop it around the festival circuit. Chicago audiences might be able to take a seat at a table to watch "Open Tables." Newell plans to ask restaurants to host dinner-and-a-movie screenings for its release.